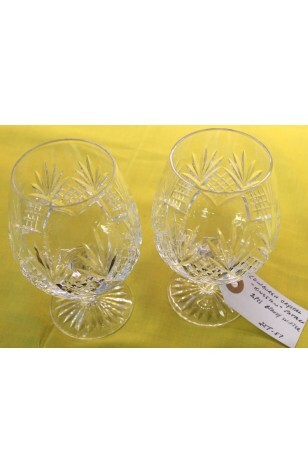 Edinburgh Cut Crystal in the "Kingston" Pattern, Two Stemmed Brandy Glasses, Made in Scotland, Circa 1980. Edinburgh Crystal High Quality Brandy Glasses in the "Kingston" Pattern from the early 1980's. The Bowl of the Glass is Cut in a Diamond Pattern, filled by Cross Hatches, and in between the Diamonds is a 5-Prong Fan. These appear to be unused, or very well cared for, Brandy Glasses, in Excellent Condition. Edinburgh Crystal High Quality Brandy Glasses in the "Kingston" Pattern from the early 1980's. The Bowl of the Glass is Cut in a Diamond Pattern, filled by Cross Hatches, and in between the Diamonds is a 5-Prong Fan. These appear to be unused, or very well cared for, Brandy Glasses, in Very Good Resale Condition unless noted below or seen in pictures.